I recently hosted the last CRAFTERNOON of 2017! 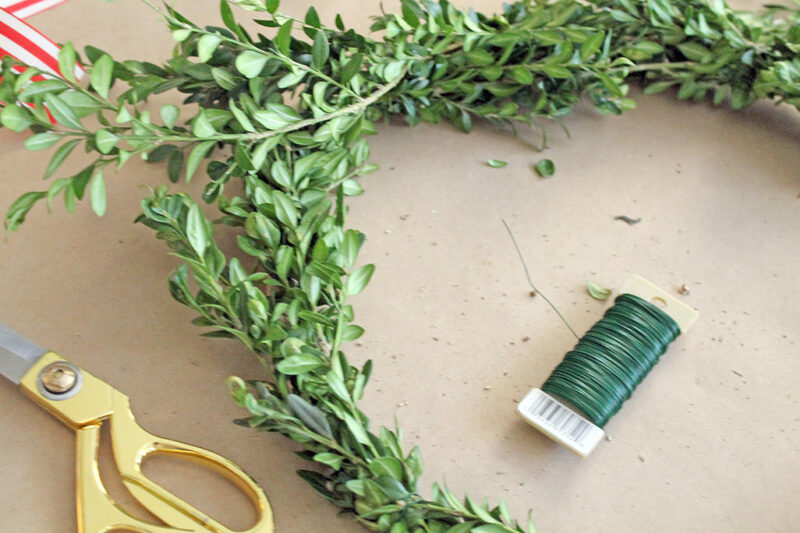 It was a fun afternoon of creating boxwood wreaths. 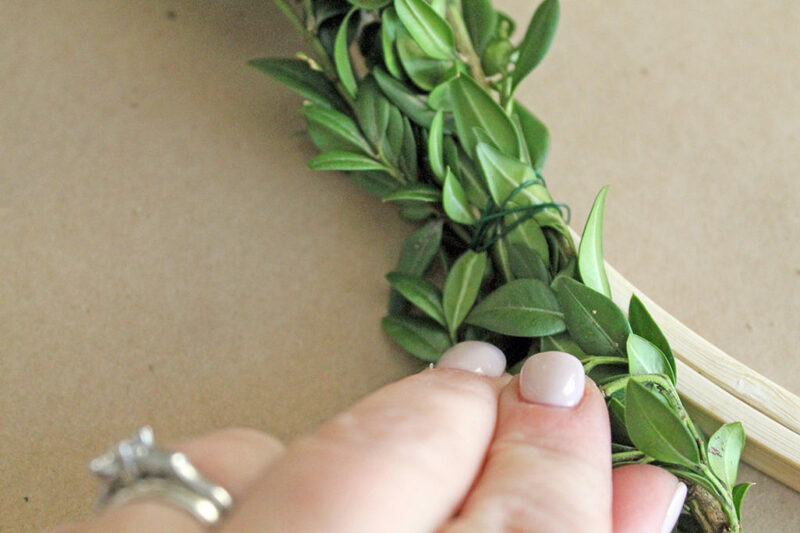 And in case you were not able to attend, today I’m giving you the simple DIY to create your own. 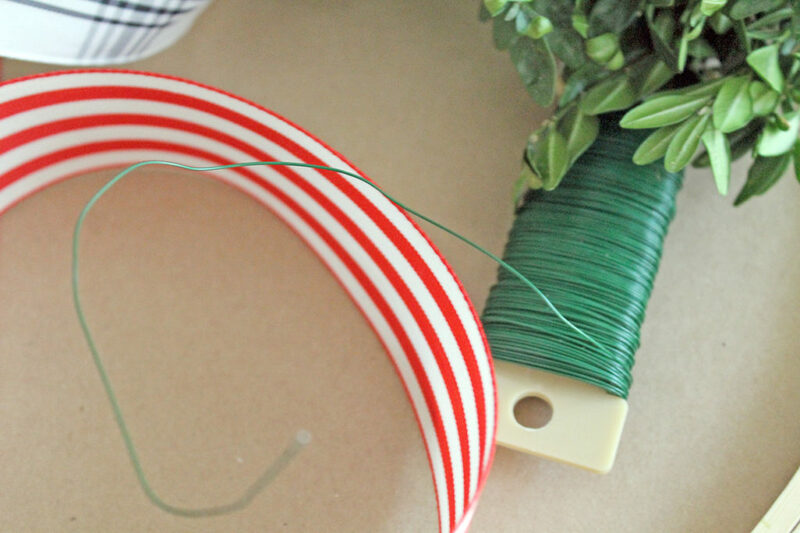 As I told the participants…if you can twist wire, you can make this! I’ll share sources for the supplies at the end of the post, but I want to give a big shout out to my source for the boxwood. I have ordered from this PLACE in North Carolina before, and it only took a few days for delivery. So I waited until just before Thanksgiving to order what I would need for the Crafternoon…I wanted it to be fresh, after all. When I started to place my online order, it said that it would ship on December 1st. Well since this event was on November 30th, that ship date was NOT going to work. I called them the day before Thanksgiving and explained the situation. 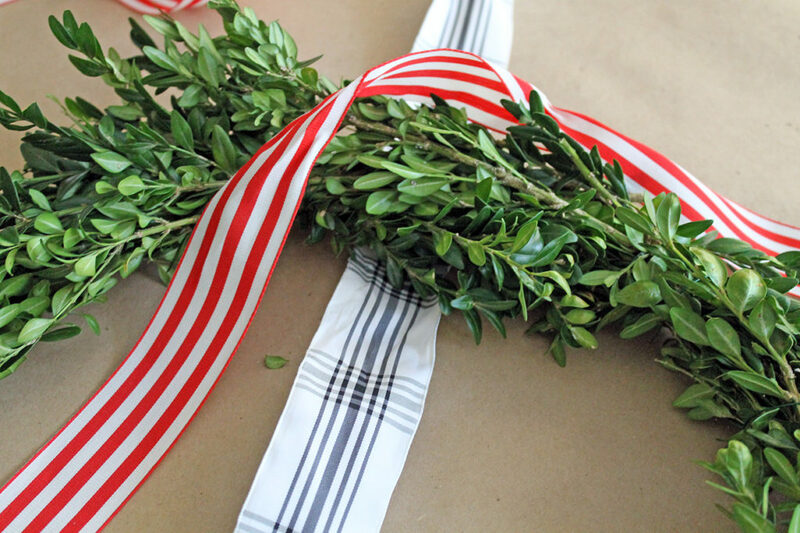 They were able to ship it the day after Thanksgiving, and I received the boxwood on Tuesday. Perfect timing for using the boxwood on Thursday! 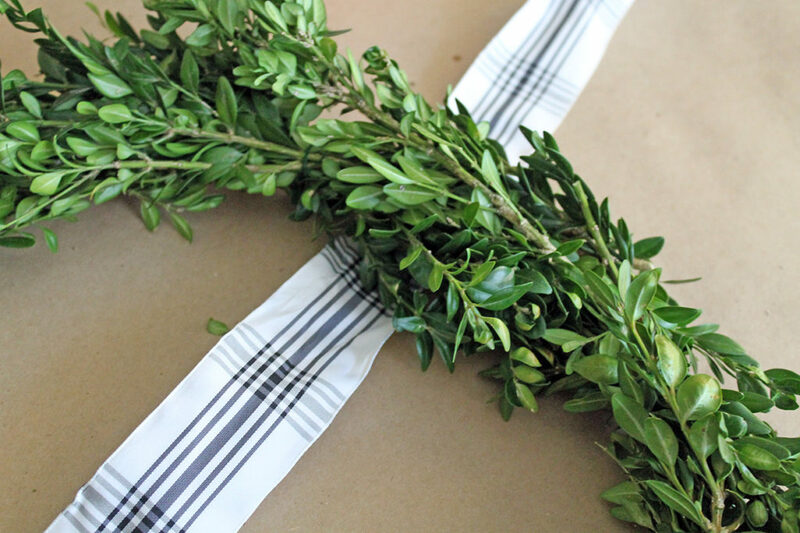 I can’t thank them enough…and did I mention how lovely and affordable this boxwood is! I simply unboxed it and placed it in a large container with a few inches of water in it to cover the stems, and kept it in my garage until using it. 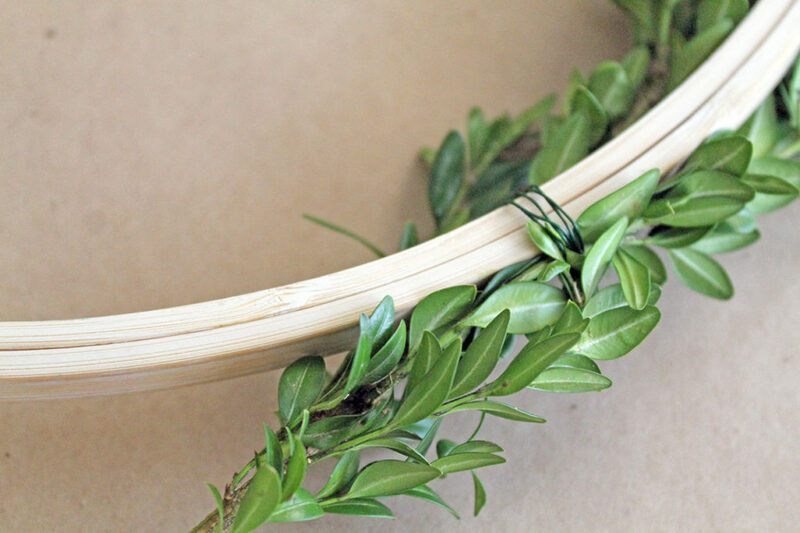 Cut small pieces of boxwood, and place them on top of the embroidery hoop. 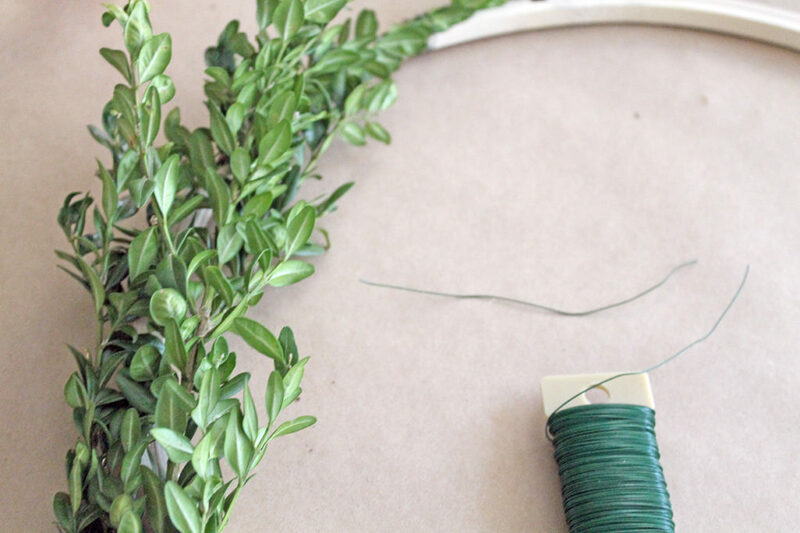 Using a few small pieces of wire, twist them around the boxwood sprigs to secure them to the hoop. Just continue doing this all the way around the embroidery hoop. Then fill in the bare spots with more boxwood and wire. You can make it as sparse or as full as you wish…depending on the look you want. 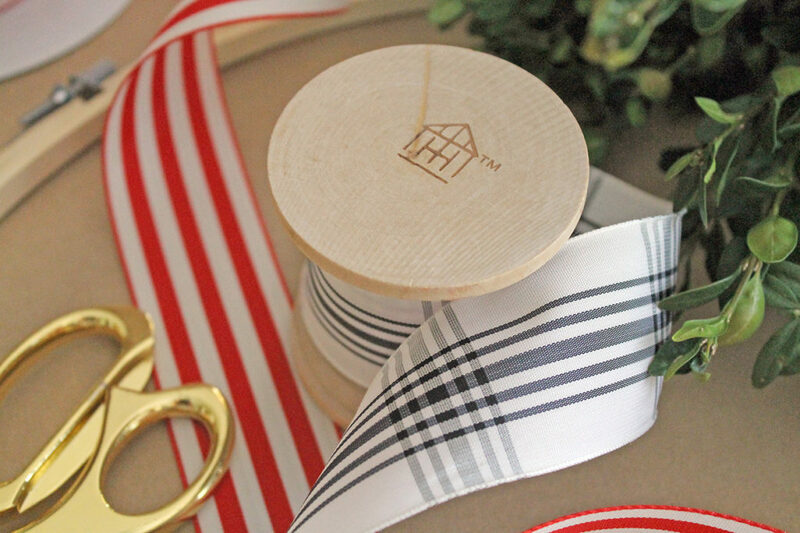 There are many ways you can attach the ribbons. 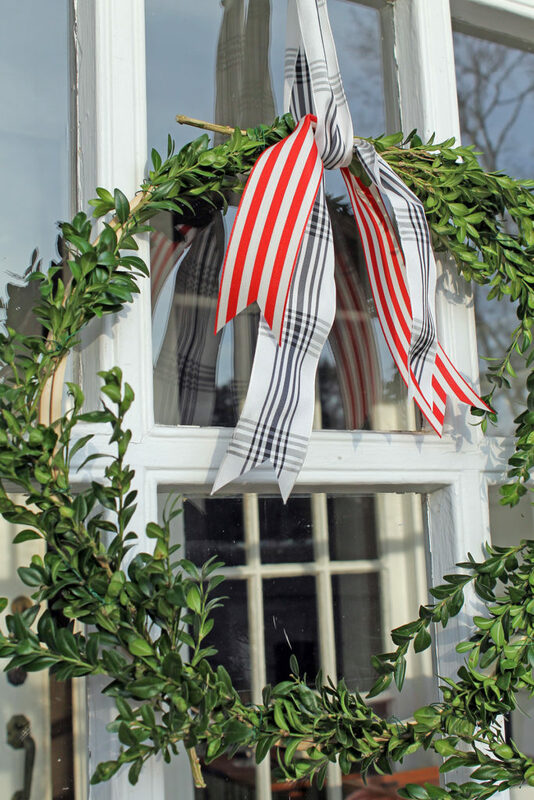 I had two shorter strips (20 inches each of the black and the red) that I attached by tying them at the top of the wreath. 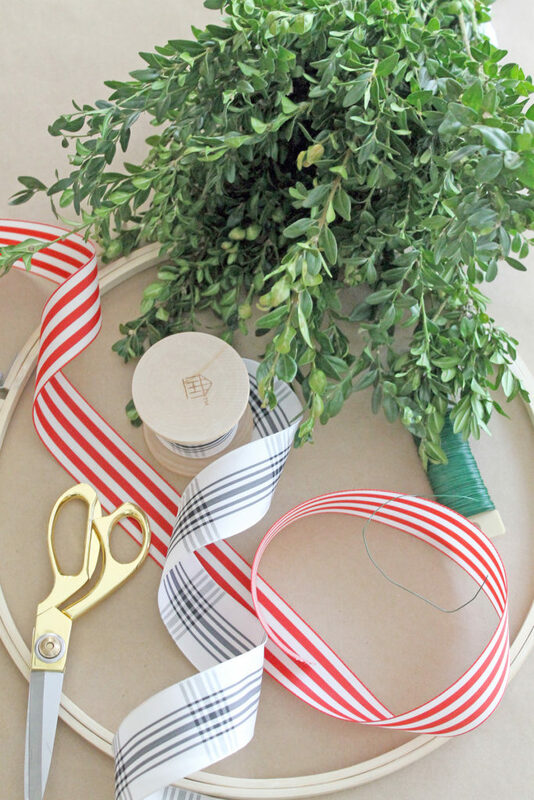 Then I looped another piece of longer ribbon (25 inches) around the wreath to make a hanger for it. 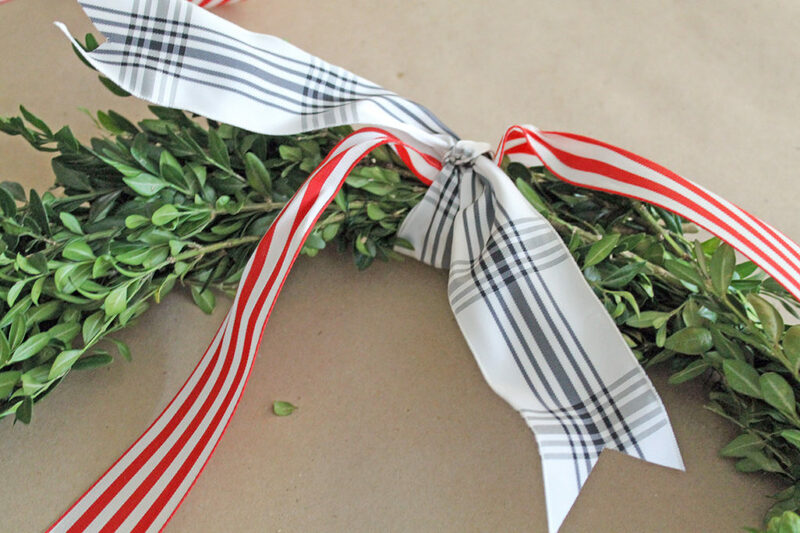 One of my “Crafternoon-ers” tied a red striped bow at the bottom and that looked very pretty. Make it your own and be creative! And that’s all there is to it! 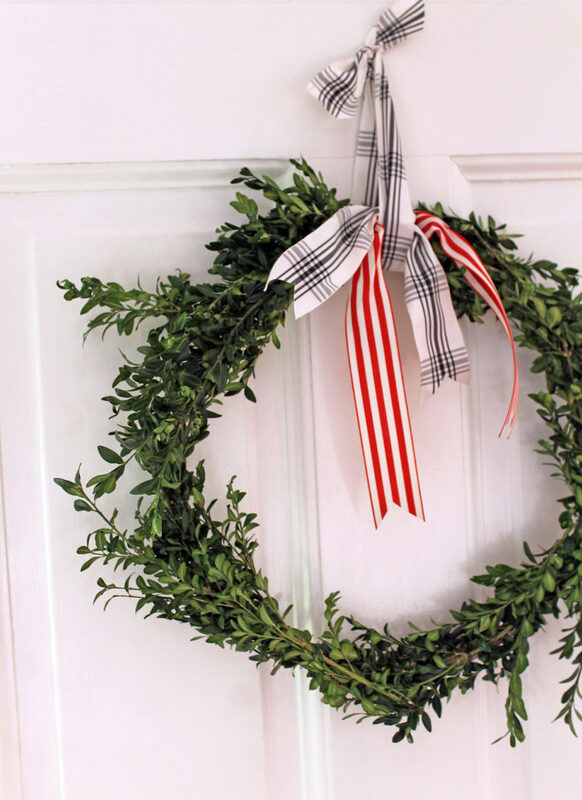 Like I said if you can twist wire, you can create your own boxwood wreath for the holidays! I’m linking supply sources below, AND make sure you read all the way to the end of this post…I have some exciting news!!! And now for that exciting announcement…I’ll be appearing on WTOL 11 Your Day tomorrow morning to share a few ideas for holiday tablescapes! That’s channel 11 between 9:00 AM and 10:00 AM for local people. 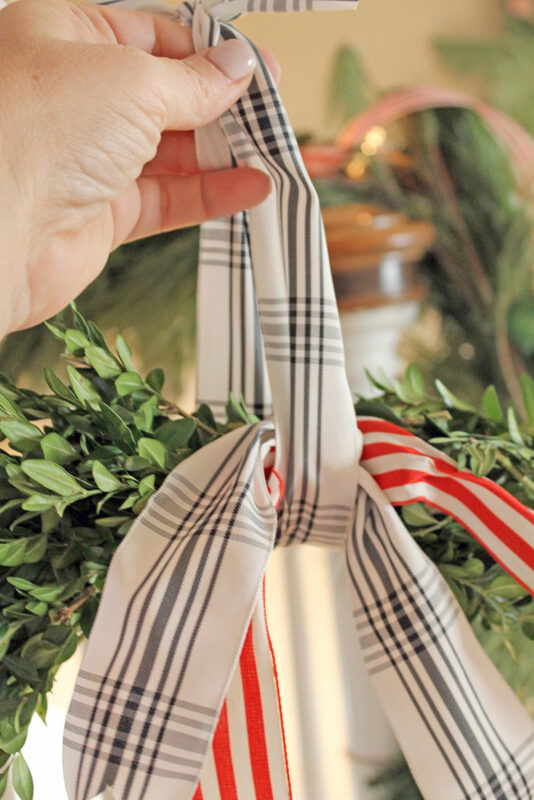 Hope you’ll be watching, as I share ways to set and decorate your table for those holiday gatherings!